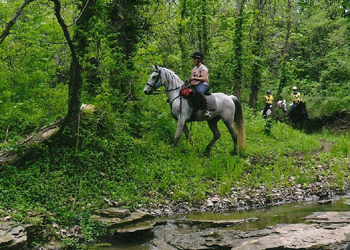 Molly is a 2002 registered Half Arabian/Half Friesian mare. She is eligible to be registered with the Friesian Sport Horse registry as well. She stands approximately 14.3 HH but seems much larger when in motion due to her uphill build. She is a sweet, kind mare with lots of get up and go. I would consider her temperament to be medium hot, and would not suggest her for a timid or inexperienced rider. She is bold, sane, and sound, but does not like to putz around. The harder she works, the happier she is. Often times, if she doesn’t feel that you rode hard enough, she will be standoffish the next time you start your ride session. has a strong canter and a ground covering extended trot that can eat away the miles while floating. It is her favorite gait and she can sustain her road trot for miles. 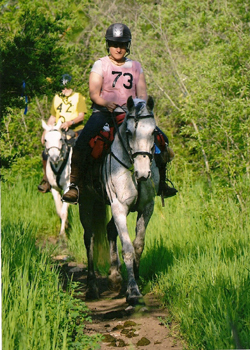 She has successfully completed three 40 mile CTRs with NATRC, Region 6 in spring of 2013. She won her weight class in her second CTR and is ready to take into endurance or the open division in NATRC. She completed all three CTRs with energy to spare and no lamenesses. She needs a rider that wants to go as much as she does. 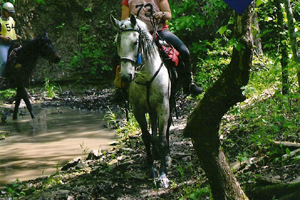 This mare can plow through 6″ of mud without batting an eye, cross any type of water or muck without issue and at whatever speed you ask, is one of the most sure footed horses I have had the pleasure of riding, and will nicker to you when you get off, provided the ride was a good one. She never balks at a challenge and actually thrives on seeing new country. 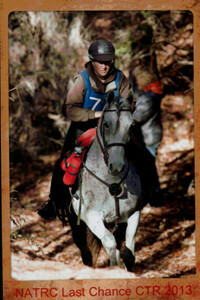 She is very competitive and while she will ride farther back in a small group, does not like it. She will let other horses pass and go ahead out of sight but does not like it. She prefers to be up in front but she will rate her speed well and march up or through anything. She has excellent rhythm and is a pleasure to ride on long trails. Molly has never taken a lame step or had any kind of illness. She is an extremely easy keeper and if not in extreme work will actually be overweight very easily. We joke that if she smells grain she will get fat when she is not in work! 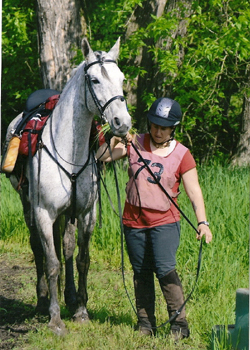 This mare will do anything you ask and has a solid Dressage foundation. She does not like arena work, but will do it, and gets nervous and chargey in the Dressage Ring at competition. 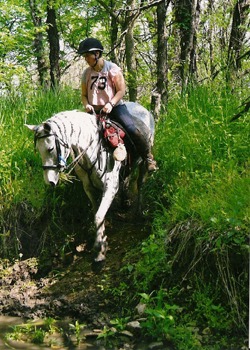 With lots of practice and work she has upper level potential and could eventually compete, however she prefers to be out covering ground and using her skills to navigate obstacles with real world practicality. 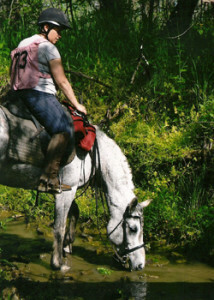 I have not had the pleasure of riding a horse more capable or connected than miss Molly. She would not be for sale but for the fact that I have small children and any horse that I have as my primary mount must be able to slow down and be ‘lazy’ when needed. She can not do that well and desires a great deal of your attention while riding – so keeping track of a 5 year old and a 7 year old on their horses takes more of my attention than is acceptable to miss Molly 😉 She does not have an ‘auto pilot’ on the trail and if you stop riding the trail, she will continue straight – right off the trail. But she will dodge and duck around trees to keep your legs safe and go where you point her. We are asking $6,500.00. 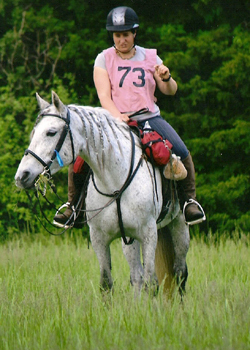 Please contact us for information if Molly sounds like the right horse for you! Reasonable offers will be considered to an appropriate home. SOLD! Congratulations to Debra Gingerich and Dark Horse Stables!